Do All Towns Starting With "T" Look Alike? Turlock is a Central Valley town which is home to the world's dwindling Assyrian (not Syrian, ASSYRIAN) population. It is also some 400 miles from Temecula. Tucked away just off busy Temecula Parkway (formerly highway 79 South) is a beautiful rose garden tended by the experts of the Temecula Valley Rose Society. Sprawling ranch-style houses dominate here, and larger McMansions dot the hills just above this horsey neighborhood. These immediate neighbors to the rose garden have playful horses who greeted us when we arrived. One of the things I miss about living in Riverside is UCR's terrific botanic garden. It was one of my favorite relaxation spots and Eva, who came home from the hospital to our Canyon Crest apartment and lived there until she was 15 months old, toddled around on the grass there on many lazy afternoons. Rose Haven's focus is definitely on roses, but they do have other natives which make good rose companions, so I can get a taste of my botanic garden fix just five minutes from home. The Temecula Valley Rose Society's Rose Haven Heritage Garden is located at 30592 Jedediah Smith (near the intersection of Jedediah Smith and Ynez/De Portola.) Open daily. Tucked into an unassuming corner space in the Armstrong/Michaels shopping center on the corner of Ynez and Rancho California Roads in Temecula is All of the Above Incorporated Bakery & Cafe. Mother-daughter owners Lorilyn and Caitlin Teasdale rolled out their bakery, the first of its kind in Temecula, a few weeks ago, and word is quickly spreading. And as Lorilyn Teasdale points out, "We may be hard to find, but once you know where we are, we're really easy to get to. 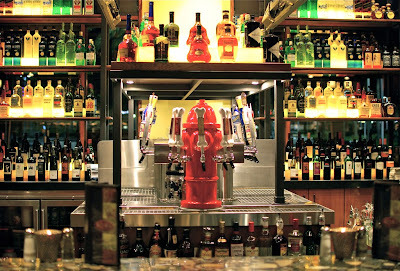 We're right off the freeway and right here in the middle of town." Lorilyn Teasdale is well known in the local autism community and has been baking gluten-free for her own family for years. You could say she is "gluten free OG." Today more and more people are switching to gluten-free diets, whether by diagnosis of celiac or suspected celiac, as a treatment or adjunct to therapies for autism spectrum or other conditions in kids and adults, or for a dietary intolerance to gluten. Many people interested in gluten-free products like to eat healthy, but the Teasdale team point out that they are a bakery, not a health food store. Their goodies are more gourmet than crunchy-granola, which is good news for gluten-free folks searching for special goodies like muffins, cupcakes, and cookies. The display cases clearly label each product, with All of the Above's signature checkmarks informing patrons whether products are gluten-free, vegetarian, vegan, or contain nuts. The interior of the space is clean, airy, and inviting, so this also is a welcome addition as a neighborhood hangout/cafe. In fact, whether or not you have special "kneads", an afternoon spent with a cup of tea and one of All of the Above's cookies or pastries would be simply heavenly. Please visit Lorilyn & Caitlin Teasdale at their All of the Above Incorporated Bakery & Cafe in the Allstate Building in Tower Plaza (near Armstrong/Michaels), 27423 Ynez Road, Temecula, (951)693-4000. Hours: 9-5 daily except Sundays, when they are open 12-5; closed Tuesdays. You can follow them on Twitter, and while you're at it, follow me too! Welcome to the 'hood, Lazy Dog Cafe! Regulars at the Promenade Mall in Temecula have been anxiously awaiting the opening of this small local chain (seven locations throughout Southern California) ever since the big mall expansion a year ago. The Daily Temecula crew got a sneak peek this week before they open to the public tomorrow. Here's a picture of our dessert, a luscious brownie decadently topped with both whipped cream and ice cream. 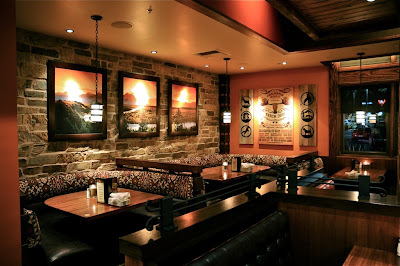 I want to support small local businesses like California Tea & Coffee Company and Public House, but there is a stereotype about the Temecula Valley that says that only chain restaurants do well here. So if we have chains -- since they are the ones with the bucks and wherewithal to get the prime locations -- we should at least have good chains. Luckily Temecula has moved past TGIFriday's and Applebee's and we now rate our own Yard House, PF Chang's, and Shogun. 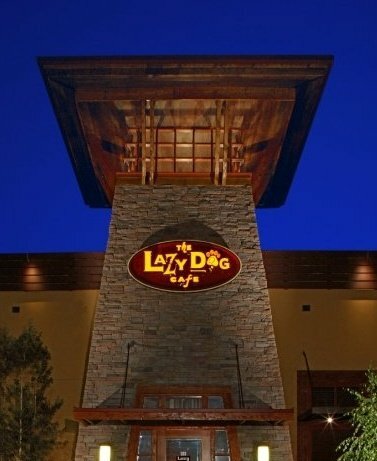 The Lazy Dog Cafe is the brainchild of Chris Simms, son of Tom Simms, founder of mega-successful chain Mimi's. 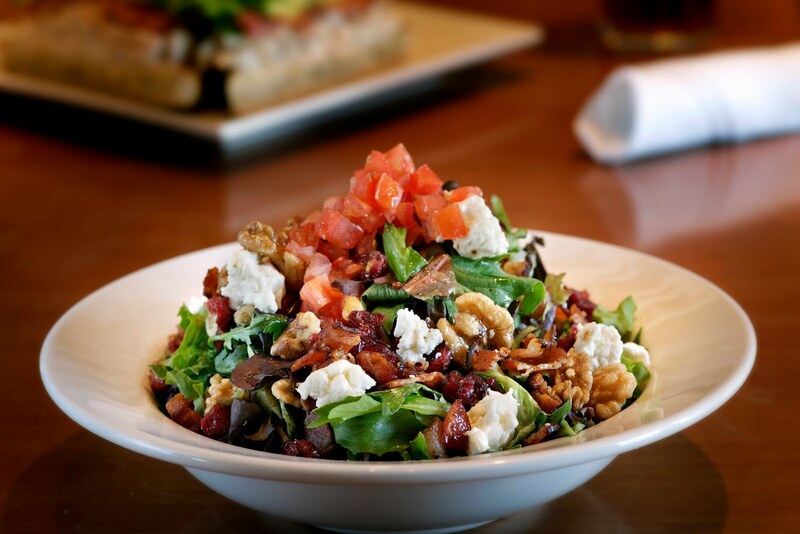 Their menu is very eclectic and there are a lot of choices. This would be the perfect place for larger parties with different tastes to share the same table. I can absolutely visualize our family (vegetarian with little kids) eating here with my New Yorker inlaws who eat according to Atkins, my meat-and-potatoes loving Dad, and my adventurous diner mom. 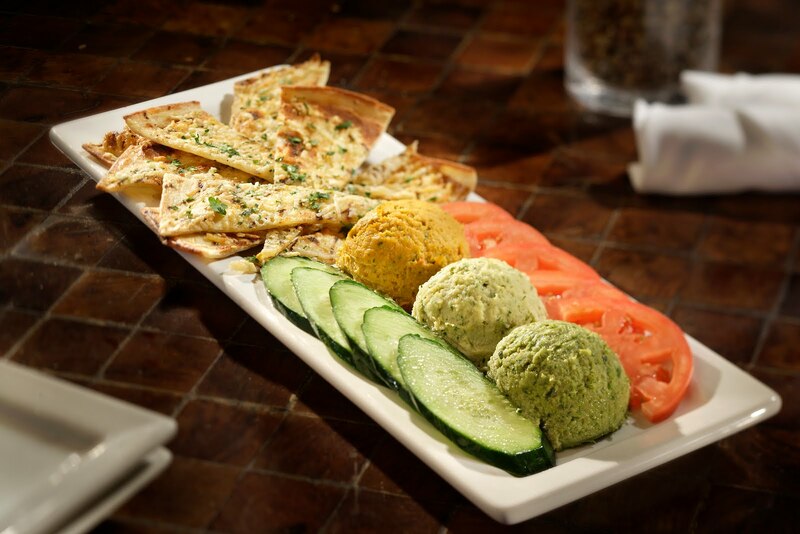 My vegetarian kids would enjoy Gardenburgers and fries, salads, Margherita pizza, and the hummus trio, and they have an ample kids' menu too, with choices for the littlest diners and a separate bigger kids' menu with larger portions and more options. 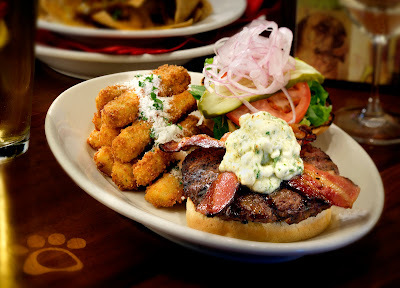 The Lazy Dog Cafe also offers a happy hour menu. The buzz is that PF Chang's had to add a happy hour menu to compete with its neighbor, Yard House. 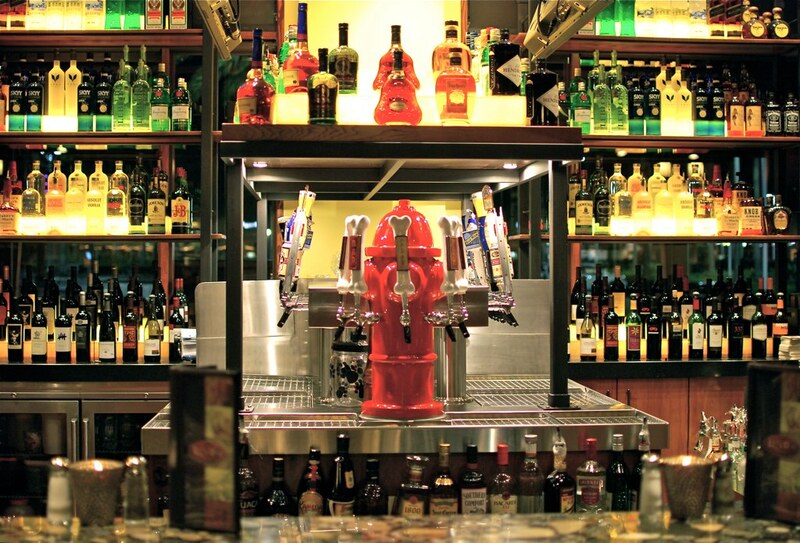 Lazy Dog will be a new contender for the after-work drink crowd. Word is they are employing 200 local residents (many part time) so that's a good thing too. Daily Temecula is in transition. On hiatus. Going from something small and independent to something larger, more interdependent, and collaborative. And it is FUN. When I created Daily Temecula in the spring of 2009, my #1 rule was: if it gets to a point of not being fun (for me) anymore, I was outta there. It has always been fun, but it got to be a bit unmanageable. I'm pretty dynamic frenetic, but I'm only one woman. So I'm learning from the past and asking for help, teaming up, buddying up, and sharing the experience with friends. For now, follow me on Twitter and keep up with me on my other blog (and here too!). Whew! Now go do something fun in Temecula today. Don't forget to follow me on twitter and mark your posts to me with #dailytemecula.